No. 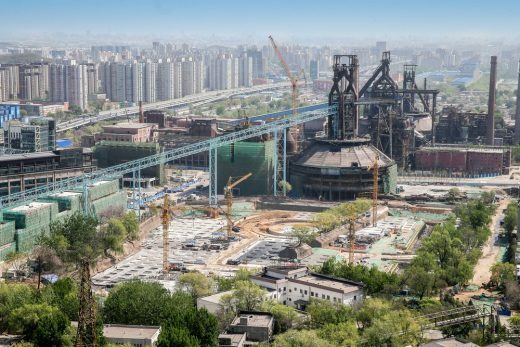 3 Blast Furnace is the first blast furnace museum in China, and also an inevitable result of excess capacity transition; it is a problem to demolish it or not, and more importantly, how to reserve it. 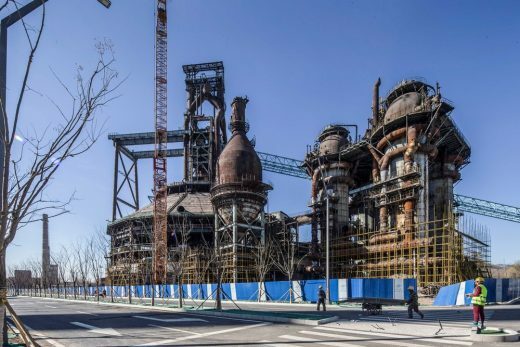 The steel museum in Essen, Germany is relatively small in volume, and it adopts the thought of applying no coating or simple coating of antirust paint; therefore, it is basically treated with a laissez-faire attitude. 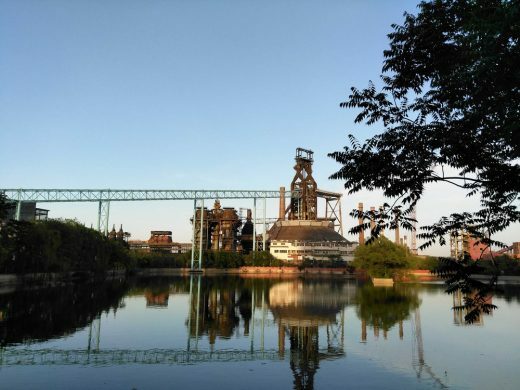 The blast furnaces in Mexico and Belgium have been thoroughly refreshed through rust removal, showing brand new appearance now. For the transformation of No. 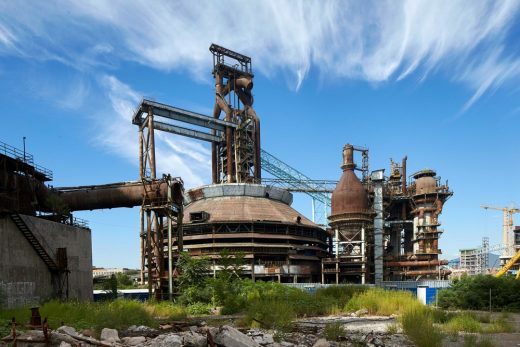 3 Blast Furnace of Shougang Group, we believe that each piece of decaying paint and each inch of mottled rust of the aged but grand blast furnace is the product of that certain time in the past. With the intention of creating an “amber” type of effect, the design adopts the manner of dust removal with high-pressure water guns, in combination with the local rust removal of grade ST2 and coating of transparent resin paint with 10% reflectivity (more than ten tests on rust removal methods and transparent reflective rate of paint have been conducted in 10 months), so as to faithfully restore and keep the marks of time, and try to freeze the time in 2017 when the blast furnace transformation was carried out. History is dynamic, which means the present today is the history in the future. 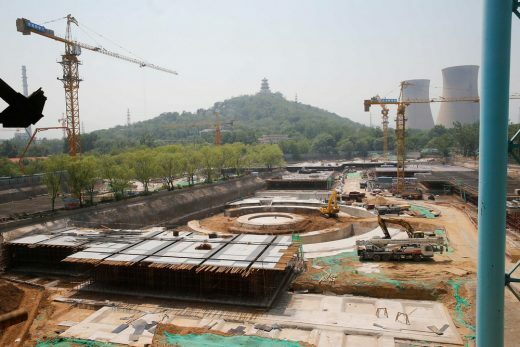 Tang, Song and Ming Dynasties have become the history, the Republic of China has become the history, and the eras of 1950, 1960, and even 1990 and 2000 have also become the history; therefore, the project carefully forms a time axis, to enable the building to record its historical points in a specific architectural mode of processing. The project does not stick to old conventions or disguise itself, but let time freely inscribe and commemorate the history. This is the positive view of history presented by the design. 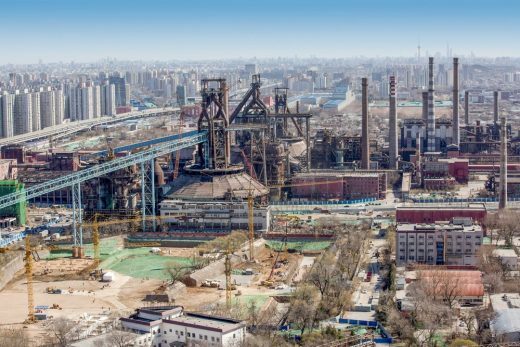 The core parts of the original industrial steelmaking constructions, such as the blast furnace, the hot-blast stove, the gravitational dust collector and the dry dust collectors are mainly reserved. The control room to the west has been opened into public space to start a conversation among the building, the show lake, and the mountain. Design uses landscape construction to arrange the programs of exhibition, meeting, canteen and cafe rooms. The boundaries of the show lake and the industrial constructions are naturally stitched by the small-scale waterside space. The circulation design creates a sequence of space between the communication of the natural environment and the industrial heritage. 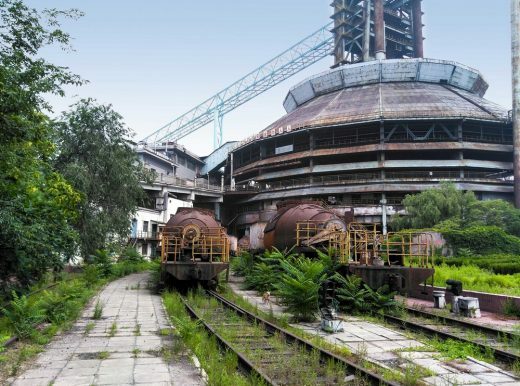 Visitors should start exploration from the show lake, stepping down the stairs, entering the underwater round garden and then look back at the blast furnace. 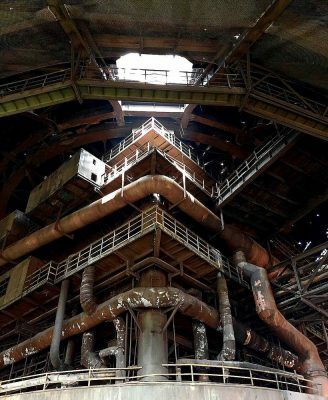 Back to the inside space of the furnace through an underwater corridor, visitors could see the whole steelmaking procedure by leveling up from 9.7meters height to 72meters height. 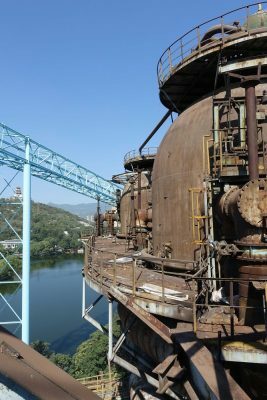 The visiting circulation says the story of industrial history. In the conversation between the extremely natural and the extremely industrial, we memorize the past glory. This project shows a dual relation under strong contrast: the extreme natural Vs the extreme artificial, the straight line and the folded, the straight forward circulation and the back and forward, the open sight and the avoided. In stitching the contrast parts, there creates a dialogue. 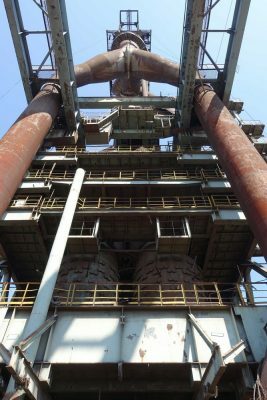 In June and July 2016, I repeatedly went to the site to understand the technical process of the blast furnace. 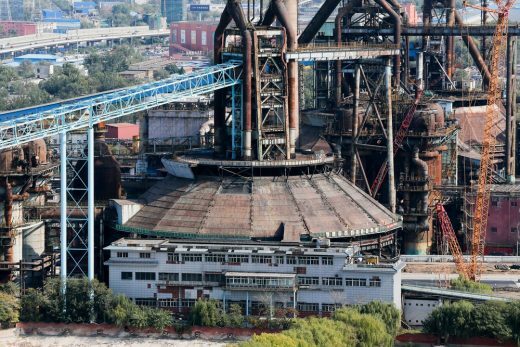 During the period, I climbed on the platform of 72m in height for more than 10 times to make clear the process and drawing, for I had to understand the technical process of the blast furnace through climbing on the platform, and asked the old technician to describe them for me, and then I would climb again and again to make clear all problems. 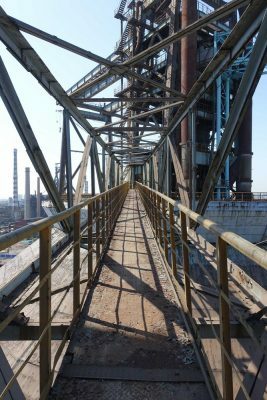 (The reason why I use “climb” here is that the internal access ladders of the blast furnace are mostly narrow and steep in 45 degree and even 60 degree in some sections, so I should climb the ladders with my hands and feet.) Most of the days when I climbed on the platform were sunny and hot, so I would sweat each time.